Home » Australia » Northern Territory (NT) » Litchfield National Park. The Termite Mounds. We arrived in Darwin at 2am in the morning. We were very exhausted after the 5h flight from Melbourne, so we picked up the car, went to the nearest quiet suburb and spent a night there sleeping in the car. The morning was beautiful: full of tropical smells and birds songs. And it was very quiet everywhere - it was early Sunday morning, so there was no anyone on the suburbs streets - no kids, no adults, no cars. We googled a place with good coffee and breakfast (thanks, Tripadvisor!) and discussed our plans for the first half of the day. The plans were quite simple: to buy some food, water, gas for the trip and to get some maps and road status update the Visitor Centre. We spent first half of the day driving from the shopping centre to Visitor Centre, then from the Visitor Centre to Bunnings (as it was the only working store where we could bought gas on Sunday) and then, finally, we headed to our first destination - Litchfield National Park! Litchfield National Park is just an hour-and-a-half drive from Darwin and features a myriad of diverse environments including rugged sandstone escarpments, perennial spring-fed streams, monsoon rainforest, magnetic termite mounds, waterfalls and historic ruins. This 1,500 square kilometre park was the original home of the Wagait Aboriginal people. The Finniss exploration was the first European connection to the area and the Park was named after Frederick Henry Litchfield, a member of the expedition. For 75 years until 1955, the area was the centre for tin and copper mining. It then fell under a pastoral lease until it was designated a national park in 1986. Although the park is not so big and its major attractions are linked by a sealed road (see park's map attached), you can spend as little as one day in the park, taking a quick dip in each of the plunge pools and rockholes on the drive through. But to really experience the true beauty of Litchfield it’s best to stay at least two days, swimming and bushwalking. As for me, the crystal-clear swimming holes were a real surprise in those hot days! Before we went to the park I read a lot about it, but thought that its main attractions will be waterfalls and termite mounds. As for the swimming, I was aware of crocodiles, and hadn't any hope that we will have an opportunity to swim a lot. It was great that the reality was absolutely different from what is said in the internet, as we spent a lot of time swimming in pools near waterfalls. I will tell you about swimming and other water activities a little bit later, as for now, I’d like to show you some photos from our first stop at Litchfield NP: the termite mounds. From a distance they look like tombstones and you wonder what kind of graveyard this is. But what you see aren't tombstones. They're actually ‘magnetic’ termite mounds which rise to as much as three metres in height, look relatively flat — and they all face the same way with their thinner edges facing north-south and broad backs east-west. This aspect minimizes their exposure to the sun, keeping the mounds cool for the termites inside. The large cathedral termite mound nearby at an information shelter that provides a fascinating insight into these remarkable creatures and their habitat. There is a formal viewing area just off Litchfield Park Rd and convenient boardwalks take you close to the termite mounds. 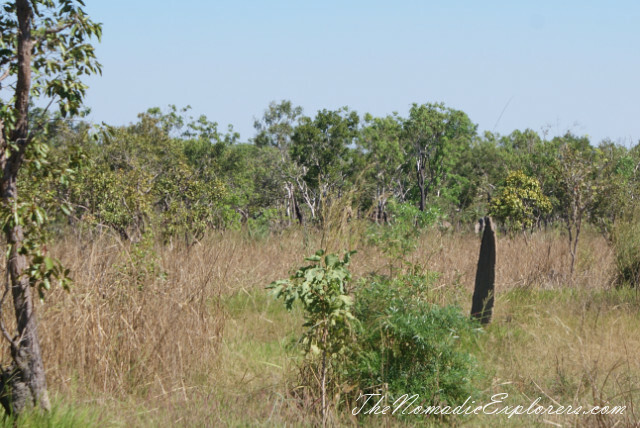 We saw numerous termite mounds when we visited the Northern Territory - they are completely different: wide and tall, yellow and red, big and small. They can ‘grow’ near the tree, under the tree and even on the tree! Moreover, there is a good exhibition in the Darwin Museum and Art Gallery with an information about those amazing little creatures. 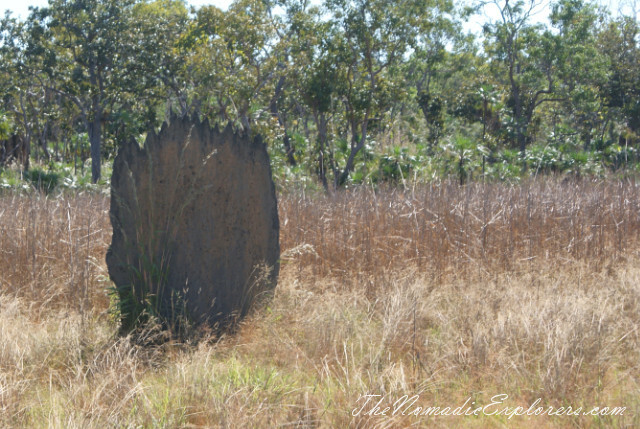 Before our visit to NT I was under the impression that termites eat trees and wood only, but now I know that the tallest ‘cathedral’ mounds are built by grass-eating termites! See that round 'ball' in the middle of the photo? It is a mound as well! I think that is enough information about termites. We took a lot of photos of ourselves near the mounds and then went further, to the Florence Falls.